1. Hypocrisy – the laughable pretence that somehow this extravaganza binds together the nations of the drug abusing, bribery riddled sporting world. How we love boring and previously unknown sports if it turns out that our lot might be good at them! 2. The BBC (bless them) insist on presenting the Games as though they were somehow a sponsor, rather than a licence-money-consuming media corporation. In particular, the pre-scripted, screaming commentary which accompanies any medal success for Our Lot is rather heavy going – unless I was mistaken, some hysterical gentleman was informing me the other evening that the victory of one of Our Lot’s swimmers was a “life affirming moment” for all of us. Let’s be clear about this, I am proud of the swimmer, and I greatly admire individuals who dedicate their lives to doing something supremely well, but I have little time for the posturing hangers-on who use public money to get in the way of the spectacle. 3. The presence of a few sports which don’t seem to me to be Olympian. You can make your own list – golf seems an oddity to me – our own hero may well be required to compete against some foreign chaps who would certainly not be welcome at your local club. Discuss. Anyway, you get the idea, and yet I find I am rather enjoying the track cycling at weird hours of the morning. I guess the Games must be OK, after all. Some odd gaps in the list of events, though. 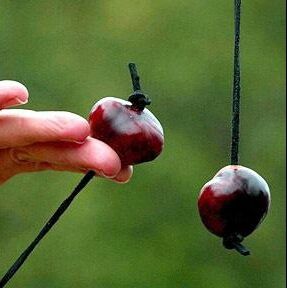 There was recent mention of the noble game of Conkers on this blog – I can think of no finer presentation of skill and individual courage, and yet Conkers does not seem to be recognised as a sport at this level. Conkers, in case it goes by different names in different parts of the world, is combat in its most ancient form – warriors armed only with the fruit of the horse-chestnut tree, pierced and mounted on a string (that’s the chestnut, not the warrior). Admittedly, the sport is normally played only by 8-year-olds, and it is heavily seasonal, but it seems a sad omission from the Olympic programme. There was recent comment about Conkers on this blog – not a celebration, but then you wouldn’t expect that. It was a more of a lament that the game has been unfairly suppressed, and for some pretty feeble reasons, too. One local school authority in England banned the game on health and safety grounds, apparently, insisting that Conkers-players should wear protective goggles and hand protection. It would be a sad thing, after all, if the teaching profession should be prosecuted over a playground accident. Some local branch of an English teaching union is also said to have claimed that Conkers is an example of the kind of competitive, elitist activity which has no place in an enlightened schoolyard. I would have loved to be an accomplished Conkers player – alas, I was a very poor performer, though I used to turn up each season with large numbers of shiny new conkers (ready pierced, carried in an old shoe-bag with a drawstring), but I was one of the fringe players whose role was to provide cannon fodder to bolster the reputations and the tallies of the true heroes and gunslingers at our primary school. There were dark arts at play – apart from techniques, sometimes of debatable legality, there were all sorts of whispered formulae involving baking in the stove, pickling in vinegar (someone once mentioned saltpetre, though when pressed he didn’t know what saltpetre was, so this was dismissed as a lie) and all sorts of weird and wonderful secrets. On occasions a secret recipe was claimed to have been handed down from someone’s granddad, which is probably a testament to the traditions of the sport rather than the effectiveness of the treatment. I recall that Kenneth Ikin had an unbeatable conker for a while – it was old, and battered, and grey, and as hard as wood. Kenneth’s supreme conker was much feared – when it was in its fourth season (I seem to recall that eventually it was a two-hundred-and-elevener, which is, let’s face it, awesome by any standards), Kenneth was forced to prowl about the playground, challenging the opposition, who were not exactly queueing up to be humiliated – as part of his warrior routine he would occasionally swing it on its string, and strike potential opponents on the head, as a call to joust. One lunchtime, as he searched for opposition, he idly took a swing at the cement capping on the low brick wall which supported the playground railings. I’m not sure what he expected, but Kenneth’s pride and joy disintegrated, with a sad, dry noise, and he was speechless. The entire school was subdued by the loss – it might have been a life-affirming moment, if we had them in those days, but there was a vague feeling that we should have given it a Viking funeral, if we could have found any bits large enough to burn. Now, half a century and 250 miles away from St Michael’s-in-the-Hamlet County Primary school’s Burdett Street playground, I live close to a chestnut tree which would have guaranteed me admittance to the inner circle of gunfighters – I have never seen such conkers, for either numbers or quality. Maybe I should take up the sport again. Tricky that – past discussions have revealed that not only the technical terminology but also the actual rules (how to treat a straight miss, punish a non-stationary target, sort out tangled strings, all that) were obviously heavily regional and varied from place to place. I wonder what sort of protective goggles we’d have to use? Hmmm. Needs more thought. What a sad tail. Such a hard grey nut should have had a nobler death, perhaps at the shell of a young green nut that had been blown down prematurely in a great storm and found by an orphan who made a string by unravelling threads from her only shirt and practing for hours to perfect the perfect tragectory ....but I digress. I do try not to think about how many tax dollars(c) go into preparing for and participating in these fun and "games" and try to sit straighter because one on ours was a nanosecond faster when it counted. After all when I feel tempted to switch funds from wargaming to say upkeep on the house I have the government's example of the importance of games. It's maybe as well that all tyrants eventually shatter into small pieces - if Kenneth's conker had simply been defeated in the usual way, I certainly wouldn't have remembered about it all these years later. History needs a proportion of eccentric stuff to keep it lively. Olympics - what a God-awful carry-on. Thr British press had the contingency shock-horror stuff written in advance, in case there were political or health problems which stopped the Games taking place - now they just have to make too much noise about the events themselves. I read somewhere the suggestion that there should be a permanent site for the Olympics, and all this unseemly bidding and bullying and bribing to get to be the host nation could stop. Not sure -might be a good idea - maybe they could keep quiet about the games from that point, and just have a small invited audience - you know, people who could give a stuff about it. Tony, I have made a decision to give up watching BBC news, I am totally fed up with this Olympics overkill. I like a bit of politics and channel 4 now have Crick who,like many heavyweight BBC journalists has made the leap to a more enlightened channel. I have given up watching 'BBC Breakfast' as there is no News to be found there, just the stupid '60 second Hoola Hoop challenge' and the like. I'm glad the footie has started again (even though West Ham lost last night), things are starting to feel a little more normal. It's just this assumption that we are all peeing our pants with excitement about Rio, call me a boring old fart but I'm fed up with it.... apart from the cycling, a sport I do enjoy, but I'm sure the BBC have gone totally OTT on the Olympics. We (the U.S.) used to see commercials featuring athletes who would ask for money "so that they could pursue their dream". Um, right, I also have a dream: 10,000 painted figures--would anyone like to send ME money? No? I thought not. The other howler was and is the fiction that the athletes are doing all this "for their country". Really? So if they should get lucrative endorsement contracts, will the rest of us share in the proceeds? No? I thought not. I believe you are correct, Chris. Harrumph. Strikes me though, that the sports included should be updated - after all, when the Olympics first started, throwing javelins and rowing boats were useful contemporary skills, but are now, even with defence cuts, no longer. Time I think for sports more in keeping with the 21st century - speed texting, perhaps? Freestyle ironing? Synchronised car washing? They could at the very least insist on the track athletes staring at their smart phones throughout the events. The hurdles would be good. Kenneth has surely been buying overpowered sports cars ever since as a means of compensation. I'm quite in agreement regarding the Olympics and its New Clothes. The IOC and the broadcasting companies are quite lucky that the Brazilians seem to have done a credible job after all, as the credibility of the event, with the kick-backs, cronies of all sorts, drug cheats, crooked judges, ticket-scapling insiders and debt-holding taxpayers (Montréal paid of its 1976 debt just last year, I believe. Utterly amazing that the grandiosely crumbling stadium did not fall before the bill was paid off), is hanging by its toe nails. If I may, I'd like to attempt to hijack your thread with a question... A few months ago you had a couple of posts about fortification models for siege games and you settled finally on some Battleground models. What is your impression of them now, after having painted them, and after having had enough time for a game or a disaster such as dropping coffee on them, or the cat...? As always, it is a great pleasure to drop in here! Welcome, Young Jim. I'm on holiday at the moment, but some of my fortifications should be on display when I get home as scenery for the Battle of Montgomery. The Battleground/Battlezone (can never remember which - Magister Militum anyway) pieces are good - I applied 2 coats of matt varnish as discussed, to protect them against the cats we do not have. I have added specially constructed MDF firing platforms, whch work well, despite some scorn directed at them in previous comments, and allow guns and troops to stand on the walls without too much special basing. They are solidly made and well cast - main issue with resin pieces is the storage requirement and the weight. I'll maybe revisit this topic shortly - certainly I should do after the Vauban-style firing platforms are ready for use. If there's anything specific you want to know, or you could use some pictures, please email me on the address in my Blogger profile. Many thanks for your reply. I was wondering about the usefulness (size vis à vi the figures used in a siege game), look and durability of the pieces. Your answer does indeed pretty much answer that, I'll keep my eyes open for your Montgomery game as well. I seem to have missed the firing platform discussion. Jim - did you see the short series of blog posts on Siege Testing a few months ago? My patent (weird) mix of 15mm buildings (and the fortress pieces fit well with the ground scale and the text books) and 20mm figures works nicely (for me, like), but I need the support buttresses to allow firers to stand on the battlements. Email if you want more details or pics. Nay - I am halfway up an Alp in the Tirol. Makes it much more dangerous to be sent off. So I'd imagine. You will probably have to slog all the way up to the top, to the tea house at the summit, in order to turn around. I have researched "Life Affirming Moment". Apparently it was the invention of "Lifestyle Coaches" Sebastian and Zarina Bludgings of Bath & Wells in the early 2000's. They faded into obscurity after being given a Govt contract to make Tony Blair appear genuine. They just ran off with the money instead. Or so it says on Google. As one who never aspired to a life of any sort, Ive always been deeply suspicious of people who are even slightly like Lifestyle Coaches - the very idea makes me shudder. Do you think they just realised they had been handed a no-hope project, and legged it with the budget? In a pathetic way, I have to admit to some admiration for their style.